Amanda Waller pays a visit to Lexcorp to see the man himself, Lex Luthor. The two converse over the recent events from Justice League vs. Suicide Squad crossover to its follow up, as "The Wall" finds herself back in charge of things. Lex gives Waller a gift, which she doesn't open, and appears to be uninterested in. Meanwhile the Squad break into the very same building's lower levels, to locate and secure an item of great importance. They unexpectedly come across some experiments gone wrong, in some malformed Superman clones, inferior Bizarros. The Squad does battle, only to catch the attention of Lex, as he heads down to put an end to the ruckus in his Super-Armor. After some back and forth with the Squad and Amanda, Lex tells her to open his gift that he gave her. Turns out Lex gave Waller a chunk of Kryptonite, the very thing she had the Squad infiltrate the building to steal for her. Once back in Belle Reve, Waller puts the Kryptonite to good use, as she uses it to cut into General Zod's head, and plant a Kryptonite Nuero-Bomb. Story - 5: This is Williams at his best, I loved this issue! Not just for the Superman connection, but the story as a whole. Waller has one of the most powerful beings in the DCU at Belle Reve, and she will do anything to use him to her advantage. With General Zod on her Squad, she has Justice League level power at her disposal. I love the way Williams wrote Lex. A smooth talking, charming man, that is in the know of all the secret events that take place unknown to the rest of the world. I love when Lex is written this way, In the post-Crisis era, Lex was a man that valued knowledge above all, as it was the best way to gain power. Here he is the same, only he has alien armor that would put even Tony Stark to shame. Also he appears to be on the side of the angels, but you can never really trust Lex 100%. One character I liked a lot this issue was Enchantress. I love how she turned the Squad into Zombies to fool the "security Lex-Bot," which didn't register them as living beings anymore. But most important, I found it funny that when she teleported the Squad into Lexcorp through her "blood portal," Capt. Boomerang's arm didn't make the trip. She mentioned that she will find it eventually, but what really caught my interest, was Deadshot asking her afterward, if she could pull anyone's arm from her "blood portal". Meaning there is a chance that Deadshot may get his arm back. This pleases me, as I don't really like the idea of him having a bionic arm. All in all, this was an awesome issue, and I can't wait to read what comes next, especially now that Zod will be officially part of the Squad. I know that he will be part of the Superman Revenge Squad over in Action Comics, but I really do hope he stays with the Squad for a while, especially since they did liberate him from the Black Vault. Art - 5: I've been a fan of Tony Daniel's art for quite some time. I think he has a wonderful technique in his story telling abilities. He knows how to lay out a page well, as every panel serves a purpose in forwarding the story. Page 2 is a great example of this, as Lex sits with Amanda, and giving her his special gift. Page 3 is one of my favorites though, I love the way Lexcorp Towers (I hope that is what they are called) are segmented off, and the view we get of the underground basement levels as well. The different Bizarros were pretty neat too. You can tell that Daniel had fun with them. Some of them made no sense visually, but this is a comic, and sometimes it's fun to draw weird looking monsters. One of the things I have always loved about Daniel's art is the way he draws tech. The amount of detail he puts into it, and the way it looks, as if it really may be functional. With that said though, the Lex Super-Armor looked a tad "flat". Which is a shame, as his Deadshot looks pretty good. Other than Jim Lee, I think Daniel is the only other artist I have enjoyed drawing this version of the costume. And as always, I need to mention the awesome colors by Tomeu Morey. They are a little de-saturated from the vivid look that Alex Sinclair bought to the page, but it works for the story. I liked the bright glow the kryptonite has, setting it apart from the green smoke from Enchantress powers. Cover Art - 5: This is an excellent cover by Daniel. It is obviously Daniel's first cover for the series, so it's a great pin up quality cover. I'm saddened by the fact that it's very generic, and not purposeful for the story, but such is the trend in comics today. It didn't feel right to lessen the grade just for that. 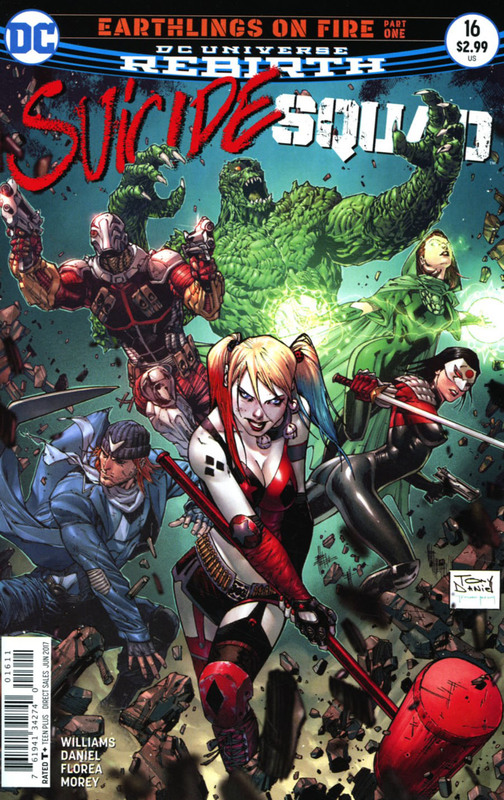 Variant Cover Art - 5: The Bermajo cover is an obvious homage to the Alex Ross cover that introduced Harley into the DCU. Swapping Joker for Lex works for story purposes obviously, though I do like idea of Lex using Harley for his own means, excellent work by Bermajo on this one.